This month we interviewed John Rainford who is passionate about using the prophetic in his art. I’m John Rainford, I’m married to Louise and we have two beautiful daughters. I work for the health service as a sonographer, doing ultrasound scans for patients referred by doctors, helping to make a diagnosis. From school age, art has always been a passion of mine. The only reason I didn’t choose art as a career was because I listened to a careers advisor who recommended I went down the science route instead! It’s interesting speaking to my professional artist friends, as they tell me having art as a hobby rather than a job means that art gives you more pleasure, rather than being something you have to do. Having said that, if I managed to make a career out of art that would be amazing! The testimony of Jesus is the spirit of prophecy, prophecy is all about pointing to Jesus and to the things of the kingdom. You can have a painting of a field of flowers that is just a painting of a field of flowers. However, when you paint a field of flowers prophetically there will be all kinds of things God is speaking to you about in that painting as you paint it. Images are very powerful in our culture, and God uses art in a way to reach people’s hearts to speak to them. Of course there is cross over as God can also speak through “secular” paintings and not every image produced in a prophetic setting will speak to people. The difference is that as you are prophetically painting, you are listening to God and worshipping him through your art. How did you get into Prophetic Art? In our prophecy team at church, we looked at our passions and what we would like to see happen in the setting of a church gathering in terms of the prophetic. This is the meeting that helped start prophetic welcome in our church which has been going really well, and also making sure we recorded any prophecies brought to the gathering. My idea was that I wanted to see prophetic art take place in the gatherings. This was something we had seen before in church, but the people that used to do it had left. So Cath said “Yes! What’s the next step?” This led me to liaise with church and get the chance to start painting within the morning gathering. Since then I’ve painted a few pictures whilst in the gathering. The first one was based on the topic “Home.” (You can see this just above this text.) This got me well and truly out of my comfort zone, I hadn’t prepared myself for how vulnerable you are standing at the front painting a picture! It’s been a year and half since then and I’ve been invited every now and again to paint at the front of church since. What’s the difference for you between painting ‘normal’ art and painting prophetic art? The difference between using your own imagination to paint and having a picture from God to paint is really significant. I think it’s a similar distinction to how when I read a book, I will visualise what the characters look like, whereas someone else may never have thought to do that, so won’t have a picture in their mind of what a character looks like. So using my imagination to paint, rather than the Holy Spirit, doesn’t give me the same sense of awe as when God gives me a picture in my mind’s eye of something to paint. When I paint in the prophetic I use skills that I’ve learnt and am developing, but I also listen to God while I’m painting and this brings a sense of awe while I do it in God’s presence. It’s about stepping out with God in it and engaging with him. I can barely remember the last time I painted something just for the sake of it rather than painting something prophetically. How does it help you to engage with God? Because of the way I’m made, the times I’ve spent soaking (resting in God’s presence), worshipping and then drawing have been really significant. As believers in Jesus we don’t just have our sins washed away but we have the righteousness of Jesus given to us so that we are righteous and can please God. That being able to please God, that my sketches are pleasing to God really encourages me. My little sketches are pleasing to God! 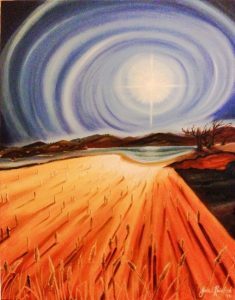 It’s really interesting what God spoke to me through the harvest field painting. I tried drawing a few sketches beforehand just drawing, but at the end of my soaking time, I felt God say to put my sketches aside and start with a blank canvas and he would give me what I needed. I feel God takes me through steps of faith where it gets more nerve wrecking in one sense, but I know that he is faithful. How do you go about painting a prophetic picture? It’s been different on different occasions. Sometimes I’ve gone with something I’ve had quite a clear picture of in my head already. Other times, I really haven’t. Having talked to Oliver Pengilley (a fantastic prophetic artist) about this I’ve discovered he has had a similar journey too. Sometimes you know what you’re going to do but other times you have no idea. On those occasions, I’ve just begun by painting and worshipping, putting colour on a canvas and just using the skills I have and saying “God I want to praise you in this.” Prophecy comes from a place of love, so I like to show my love of God through my painting. One painting I started just by making little swirls on the canvas, simply having fun with God and enjoying his presence and then gradually something started to build up which eventually led me to know where to go next. 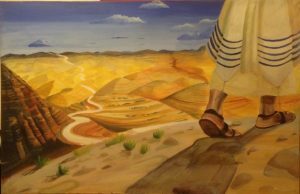 It’s about engaging with God in every step, asking God “what should I do next?” I recently chatted to another prophetic artist, Oliver Pengilley, he as a professional uses a lot of reference photographs and pictures and I use these too, learning how things look and using those to help me make a picture. I use my skills as an artist, but prophetic art is all about coming from a place of intimacy, I always soak before a painting, so it’s about spending time with God in doing this thing that I enjoy. How do you use prophetic art as worship? Just like a musician can sing and worship God by raising their voice and playing an instrument, a painter or artist can paint to worship the Lord. It’s interesting that scripture says “don’t make graven images” it’s important that you’re not lifting your art above God, making sure that it’s not seen as putting something in the way of God, but that it’s actually something engaging with the Holy Spirit and praising God. It’s knowing the pleasure that God has in us deriving from the fact that we are his children and he delights in us worshipping him by doing a painting. It’s something that at home I haven’t really done much, but it would be good for me to get into the habit of saying God I just want to paint for you not for the purposes of anything other than worship, more often that I am now. 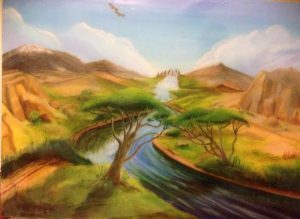 Do you think those who aren’t artistic could benefit from prophetic painting? Absolutely! Oliver Pengilley ran a workshop at our church a couple of weeks ago and we had a few people that hadn’t painted since school age and it was a very positive experience for them. One of the ladies who was there had felt God say “I want you to paint for me” so she was there not having painted since school, and it was getting out of her comfort zone but it was really positive. The number of people that said “this is incredibly relaxing!” was very encouraging. There’s a sense of disengaging with many of your thoughts and stresses that are occupying your mind and just focussing on worshipping God through painting. It can be quite therapeutic, people came in with crowded thoughts, but then just focused on God and the painting so lots of people found it distressing. A lot of people who have quite a lot of brokenness or hurts find art very therapeutic hence art therapy. A lot of people say “I can’t do that” but I think everyone can learn to be creative, not everyone will create “masterpieces”, but everyone can learn to engage with art, have a go and have fun with God. Do you have any tips for those wanting to give it a go? “The longest journey starts with a single step.” You just need to show up and have a go. Grab a pencil and paper, spend time waiting on God, maybe reading the word of God, perhaps a good place to start is by looking at one of the Psalms and meditate on the word of God and let that be you inspiration. Then just begin, don’t be discouraged if what you see isn’t what gets put on the paper, just keep going and learning. Also, it would be great for us in gatherings to have times where you might have a couple artists doing things because it would be interesting to have two prophetic artists and see how God speaks through both in different ways. It’s all about willingness to have a go, all the amazing artists you see all had a first time for doing it. So I think it’s about just stepping out and seeing what God speaks through your drawings whether they’re just a mix of colours and shapes, or a master piece. Where can we see your art, potentially commission a piece? I have an e-mail address jrpropheticart@gmail.com if you want to get in touch or commission any art, currently I don’t have a website but it is something I need to get cracking on with. I’ll update you when I have one! John painted my husband and I a prophetic picture for our living room when we bought a new house. It’s so lovely to have a painting that you know has been painted in worship to God, with the Holy Spirit’s input on what you will see when you look at it. 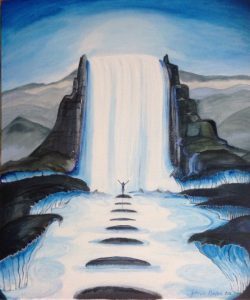 This painting is based on a few different verses in the Bible that were highlighted to John as he was worshipping God and praying for us such as Psalm 121:1-2 and Isaiah 40:31, and also on the way in which God speaks to both Shaun and I. I love water, waterfalls, rivers etc. and Shaun loves the imagery of the temple in the Bible so John was able to include those in the painting for us as well. I’ve also enjoyed doing a little prophetic art myself, although it’s only doodles in my journal, I find that God really speaks to me through the pictures that I find myself drawing. All the pictures featured in this blog post are prophetic paintings by John Rainford.